Okay, yeah, I know what you're thinking, "I already know how to fail. And I do it really well". 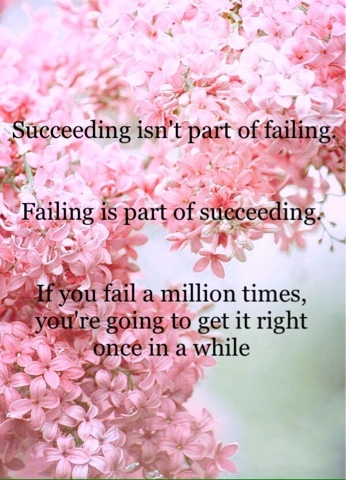 Well, failing isn't about messing up, its about what you do after you don't succeed. It's about going back and apologizing, making things right, trying harder or just doing it over and over again. God doesn't want us to fall down, He wants us to rise up on wings like eagles! He loves us, period. Nothing can separate us from His love. So next time you fall down, stay there, but on your knees. Pray, ask for strength and guidance. Then let him help you up. And try again. It doesn't matter what has gone wrong. Maybe it's your fault, or maybe someone else's, or perhaps you are just having a bad day. But whatever you are going through, one thing is for sure, God is always good and He wants what is best for you. You are right where He wants you to be. And He allows you to go through trials for a reason. Her birthday started off with... well, in all honesty I don't know exactly how her birthday started. She woke me up. Okay, yeah, I know I should have been the one to wake her, but I was up late decorating. You gotta give me some points for that, right?! Once I was out of bed, we ate breakfast, got dressed, and then, as I have been promising her since her last birthday, we pretended anything and everything she wanted. After lunch we had cake and opened presents! I'm always glad that her birthday is one day before mine (Surprise! I forgot to tell you!) instead of vise versa, because then I have one day less to keep secrets. While Willa and I played the day away, our Mom made delicious banana cupcakes! They. Were. So. Good. 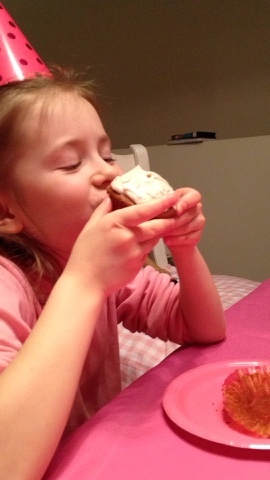 Seriously though, Willa will only eat the frosting off of most cupcakes, but these she ate in three big bites.